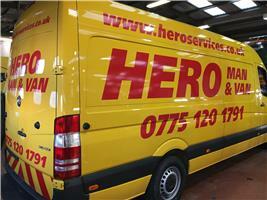 Hero Services - Removals/Storage based in Sheffield, South Yorkshire. including Removals / Storage, Courier services and more! You can be rest assured when you book with HERO MAN AND VAN you will get exactly what you pay for! We never fail to turn up, our customer feedback is exceptional. We know how to look after our customers. We have Goods in Transit insurance and Public Liability insurance. We provide a reliable, friendly and trustworthy service at a good price with customer satisfaction, no move is too big or too small! Single item to full house removals, Private or commercial contracts welcome.